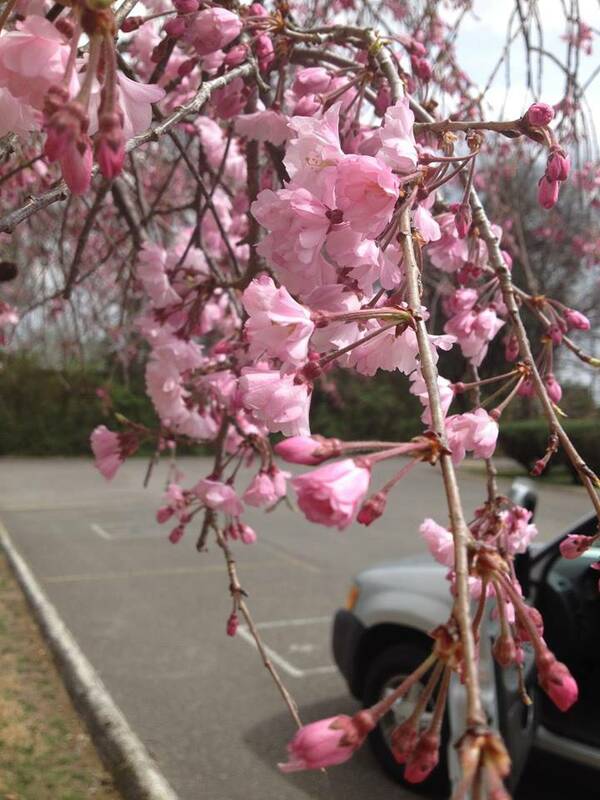 Kwanzan Cherry is a cultivar of the Japanese FLowering Cherry (Oriental Cherry, Hill Cherry), Prunus serrulata. 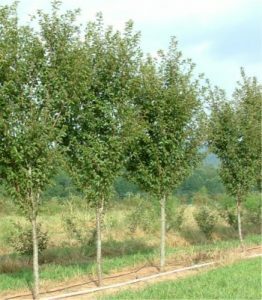 While the origin of many of the Prunus serrulata cultivars is lost to antiquity and while many cultivars of Prunus serrulata are not true selections, they are often treated that way for convenience. Japanese Flowering Cherry trees were one of the first Asian cherries to be introduced through Europe beginning in 1822. 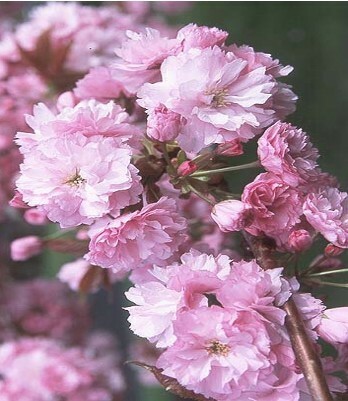 Kwanzan Cherry is the most popular and probably hardiest of all the double flower type cherries and is easily the most produced of the Japanese FLowering Cherry. 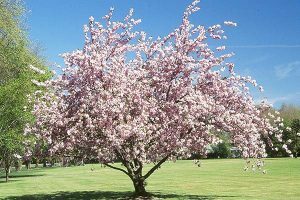 With deep pink, double (30 petals) that are 2 and 1/2 inch diameter flowers, the tree is utilized from Boston to Atlanta for every conceivable landscaping purpose. As a cultivar of the Japanese Flowering Cherry, it typically grows 30 to 40 feet high and wide at maturity and blooms from mid April to May. More planting instruction can also be found at boydnursery.net/planting/. Leaves: Leaves are alternate, simple, ovate to ovate-lanceolate, rarely obovate, 2 to 5 inches long, 1 to 3 inches wide, abruptly long acuminate, cuneate or rounded, serrate or often serrate with aristate teeth. Leaves are lustrous dark green and reddish brown or bronze when unfolding. Fall color is often good bronze to subdued red. Size: About 20 to 30 feet in height with an equal spread; can be smaller or larger depending on the area of the country. Habit: In youth, vase-shaped in habit, with age, forming a rounded appearance with distinct stratified branching pattern; very strong horizontal lines are evident in old age. Rate: Slow, pssibly medium in early stages of growth. Flowers: The true flowers are small and inconspicuous and are produced in a 5/8 inch diameter rounded umbel on the upright 2 inch long peduncle that originates from short lateral spurs at the end of a small 2 to 4-leaved twig; the creamy white bracts are the showy part of the inflorescence and are borne in June, approximately 2 to 3 weeks after those of <i>Cornus florida</i>; the 4 bracts are taper-pointed, 1 to 2 inches long, 1/4 to 3/4 inches wide; the flowers, being stalked, are raised above the foliage creating a milky way effect along the horizontal branches; the bracts persist for up to 6 weeks and longer; in the aging process they often become pinkish. 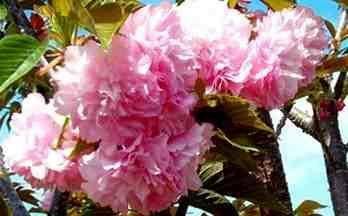 Tremendous interest in a pure pink or rose bracted form but most start white and age to pink. Diseases & Insects: None serious, some borer damage reported. Landscape Value: Handsome small specimen tree or shrub, excellent near large buildings or blank wall, tends to break up harshness with horizontal structure, works well in shrub border or in a foundation planting at the corner of the house; the horizontal lines break up the vertical lines and make the ho0me appear larger; difficult to overuse this plant; the flowers appear in May to June when there is often a paucity of color; perhaps the finest specimens in the United States are located at Longwood Gardens. Soil Preference: Transplant balled and burlapped as young specimen, considered more difficult to grow than <i>Cornus florida</i>, but this is doubtful. 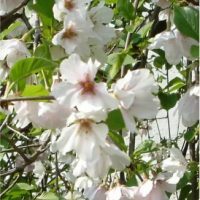 Enjoys acidic, well drained soil and seems to perform best in sandy soil with good organic matter content.